We built our business to maximize client value with affordable solutions. We're committed to understanding your needs from the moment you first call our product specialists. We bring over 50 years of demolition and environmental experience ranging from a single-story home to industrial decommissioning of process equipment and facilities. We’re here to provide owners and general contractors with a trusted partner and environmentally aware alternative to traditional demolition means and methods. We now operate multiple stand-alone verticals that support and enhance the demolition operations, including waste hauling, concrete crushing, and Browns Mill Recycling, our full-service ferrous and non-ferrous recycling center. The addition of these sister companies allows Green Circle to provide a robust, turnkey proposal. The staff at Green Circle Demolition prides itself on nearly 120,000 hours of work without any lost-time incidents. We maintain industry leading insurance and bonding capacity that allows us to perform almost any project. Our full-time mechanics helps to ensure no equipment related downtime on any client projects. Providing our customers with a single point of contact and complete project control is one of our primary advantages in the marketplace. When issues arise, we can respond to them with the speed that only a full service firm can. We are looking to partner with all of our clients to provide the maximum value for their needs. We will work on hard bid, T&M, or construction management basis with our clients depending on their needs. 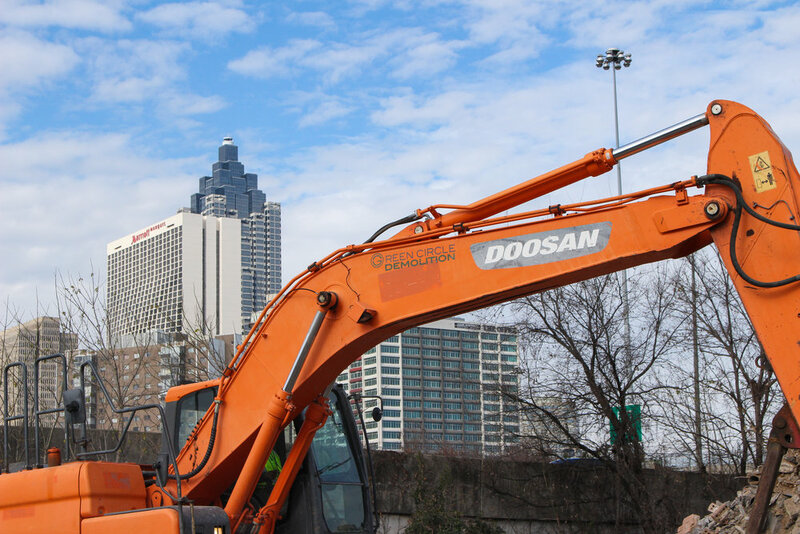 Green Circle Demolition maintains a fleet of trucks, trailers, heavy equipment, and specialized attachments to provide our clients with on-demand service. From inception, the company has plowed any retained earnings into continually upgrading and adding fixed asset classes to better serve our clients. Below is an abbreviated list of the assets available.